This screen can be reached from the Help menu on the Main screen, or from the About screen. 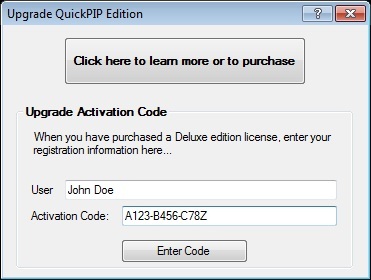 It is used to activate QuickPIP Deluxe Edition, once you have purchased and received your activation code. When you receive your activation code information, it will include a user name and a code. Enter both items into the spaces provided and click the Enter Code button to activate the product. You must enter the same user name that was provided to you with your activation code. Do not share activation codes with others! When a valid user name and code combination is entered, a message will appear to indicate that activation has been successful. The product will then instantly transform into the applicable premium edition. If you leave this screen without successfully activating a premium edition, this product will continue to operate as the limited Free Edition.